Erratic Fudgets: A Semantic Theory for an Embedded Coordination Language. Gives a translation of the stream processor calculus from the Fudgets thesis into a call-by-need lambda calculus with an erratic choice operator. BibTex entry. 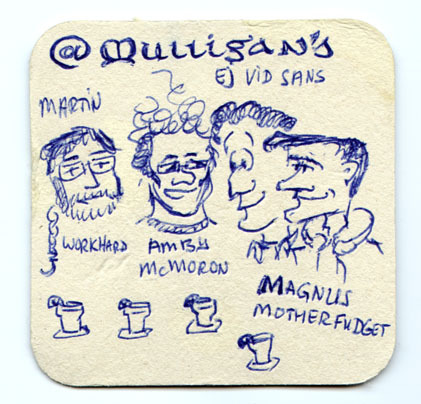 This drawing made by Martin Weichert shows Martin together with the authors (Andrew Moran, David Sands, and Magnus Carlsson), right after the presentation at Coordination'99 in Amsterdam. Lecture Notes from the Spring School on Advanced Functional Programming in Båstad 1995. Also published by Springer Verlag as LNCS 925. An FPCA-93 paper describing the Fudget system. This was the first publication of fudgets. A longer technical report describing the Fudget system. Contains the stuff in the FPCA-93 paper and some more. Presented at the departmental Winter Meeting 1994. The above two papers both describe how the Fudgets library can be used to write client/server applications that communicate via the Internet. The latter also describes an implementation of the classical Space Invaders arcade game using Fudgets. Last updated on 9 Dec 1994. Not adapted to the latest release. Use the Spring School Lecture Notes above instead. A Haskell tutorial by Paul Hudak and Joseph H. Fasel.